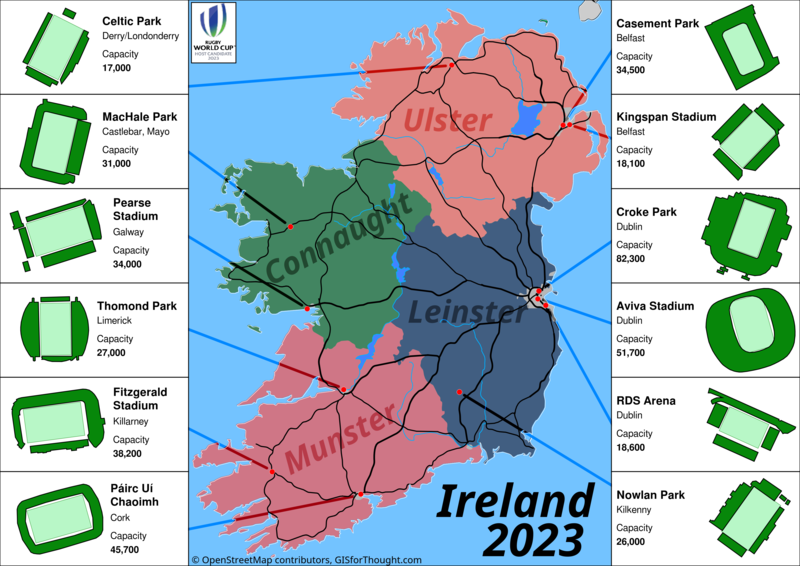 Ireland is bidding for the 2023 Rugby World Cup. They have submitted 12 stadiums in their bid. They cover all four provinces and the breadth of the island. Ranging from Europe’s third biggest stadium Croke Park in Dublin. Welcoming 1.5 million fans every year. Packing in 82,300 dedicated fans every year for the GAA (Gaelic Athletic Association) Hurling and Gaelic Football finals. An integral part of Ireland’s history through sweat, blood, and identity. The Aviva Stadium in Dublin, the worlds oldest international rugby stadium. Venue for the 2011 Europa League Final between Portuguese sides Porto and Braga. Ravenhill Stadium in Belfast. Home of Ulster Rugby and in 1991 venue for Japan’s first match victory in a Rugby World Cup. Thomond Park in Limerick. Heart of the community and host to a 12 year unbeaten run for Munster rugby. Winner of the ‘Best Rugby Stadium in the World’ vote in 2013. This entry was posted in All, Ireland, OSGeo, QGIS on 10/26/2017 by Heikki Vesanto.